This is the third post in a collaborative series titled “Environmental Historians Debate: Can Nuclear Power Solve Climate Change?“. It is hosted by the Network in Canadian History & Environment, the Climate History Network, and ActiveHistory.ca. There is no longer any debate. Humanity sits at the precipice of catastrophic climate change caused by anthropogenic greenhouse gas (GHG) emissions. 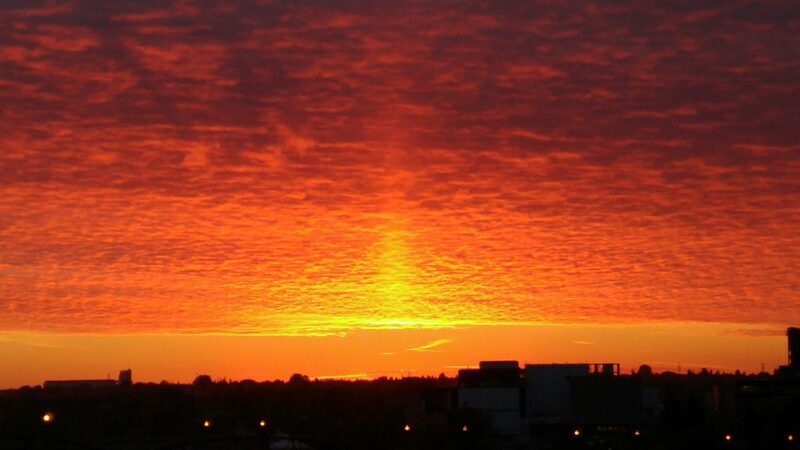 Recent reports from the Intergovernmental Panel on Climate Change (IPCC) and the U.S. Global Change Research Program (USGCRP) provide clear assessments: to limit global warming to 1.5ºC above historic levels, thereby avoiding the most harmful consequences, governments, communities, and individuals around the world must take immediate steps to decarbonize their societies and economies. Change is coming regardless of how we proceed. Doing nothing guarantees large-scale resource conflicts, climate refugee migrations from the global south to the global north, and mass starvation. Dealing with the problem in the future will be exceedingly more difficult, not to mention expensive, than making important changes immediately. The only question is what changes are necessary to address the scale of the problem facing humanity? Do we pursue strategies that allow us to maintain our current standard of living, consuming comparable amounts of (zero-carbon) energy? Or do we accept fundamental changes to humanity’s relationship to energy? In the industrialized countries of the world, the techno-optimist approach enjoys the greatest support. Amongst those who think “technology will save us,” decarbonizing the economy means replacing fossil fuel energy with “clean” energy (i.e. energy that does not emit GHGs). Hydropower has nearly reached it global potential, and simply cannot replace fossil fuel energy. Solar, wind, and to some extent geothermal, are rapidly growing technological options for replacing fossil fuel energy. And as this series reveals, some debate exists over whether nuclear can ever play a meaningful role in a twenty-first century energy transition. The quest for new clean energy pathways aims to rid the developed world of the blame for causing climate change without the need to fundamentally change the way of life responsible for climate change. In short, those advocating for clean energy hope to cleanse their moral culpability as much as the planet’s atmosphere. This is the crux of the climate change crisis and the challenge of how to respond to it. It is not a technical problem. It is a moral and ethical problem – the biggest the world has ever faced. The USGCRP’s Fourth National Climate Assessment warns that the risks from climate change “are often highest for those that are already vulnerable, including low-income communities, some communities of color, children, and the elderly.” Similarly, the IPCC’s Global Warming of 1.5ºC report insists that “the worst impacts tend to fall on those least responsible for the problem, within states, between states, and between generations.” Furthermore, the USGCRP points out, “Marginalized populations may also be affected disproportionately by actions to address the underlying causes and impacts of climate change, if they are not implemented under policies that consider existing inequalities.” Indeed, the IPCC reports, “the worst-affected states, groups and individuals are not always well-represented” in the process of developing climate change strategies. The climate crisis has always been about the vulnerabilities created by energy inequalities. Decarbonizing the industrialized and industrializing parts of the world has the potential to avoid making things any worse for the most marginalized segments of the global population, but it wouldn’t necessarily make anything better for them either. At the same time, decarbonization strategies imagine an energy future in which people, communities, and countries with a high standard of living are under no obligation to make any significant sacrifices to their large energy footprints. 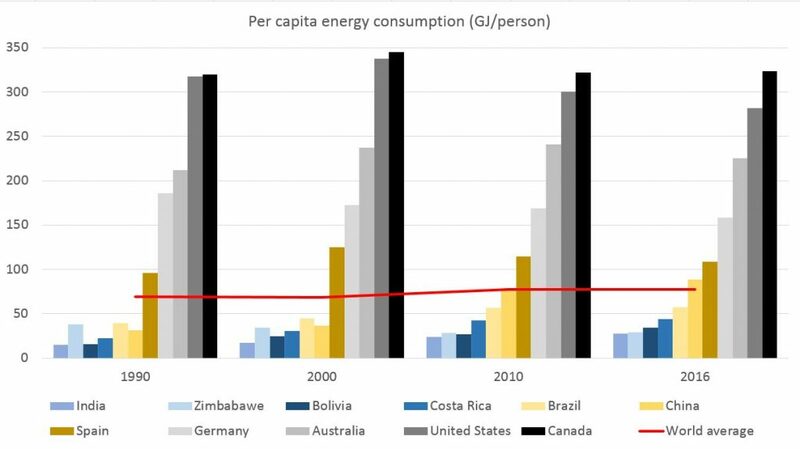 Over the last thirty years, industrialized countries, such as Germany, the United States, and Canada have consistently consumed considerably more energy per capita than non-industrialized or industrializing countries (Figure 1). In 2016, industrialized countries in North America and Western Europe consumed three to four times as much energy per capita as the global average, while non-industrialized countries consumed considerably less than the average. Most of the research that has modelled 1.5ºC-consistent energy pathways for the twenty-first century assume that decarbonisation means continuing to use the same amount of, or only slightly less, energy (Figure 2). 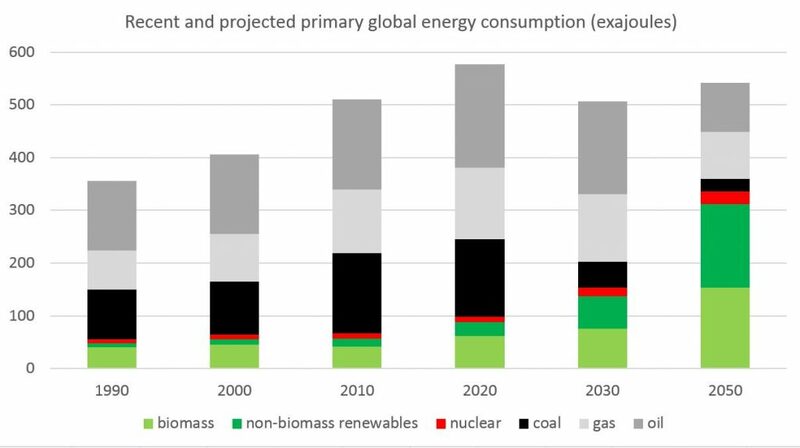 Most of these models project that solar and wind energy will comprise a major share of the energy budget by 2050 (nuclear, it should be noted, will not). Curiously, the models also project a major role for biofuels as well. Most alarmingly, however, most models assume major use of carbon capture and storage technology, both to divert emissions from biofuels and to actively pull carbon out of the atmosphere (known as carbon dioxide reduction, or negative emissions). The important point here, however, is not the technological composition of these energy pathways, but the continuity of energy consumption over the course of the twenty-first century. In case it is not already clear, I do not think technology will save us. Solar and wind energy technology has the potential to provide an abundance of energy, but it won’t be enough to replace the amount of fossil fuel energy we currently consume, and it certainly won’t happen quickly enough to avoid warming greater than 1.5ºC. Biofuels entail a land cost that in many cases involves competition with agriculture and places potentially unbearable pressure on fresh water resources. Carbon capture and storage assumes that pumping enormous amounts of carbon underground won’t have unintended and unacceptable consequences. Nuclear energy might provide a share of the global energy budget, but according to many models, it will always be a relatively small share. Techno-optimism is a desperate hope that the problem can be solved without fundamental changes to high-energy standards of living. The current 1.5ºC-consistent energy pathways include no meaningful changes in the amount of overall energy consumed in industrialized and industrializing countries. The studies that do incorporate “lifestyle changes” into their models feature efficiencies, such as taking shorter showers, adjusting indoor air temperature, or reducing usage of luxury appliances (e.g. clothes dryers); none of which present a fundamental challenge to a western standard of living. Decarbonization models that replace fossil fuel energy with clean energy reflect a desire to avoid addressing the role of energy inequities in the climate change crisis. Climate change is a problem of global inequality, not just carbon emissions. Those of us living in the developed and developing countries of the world would like to pretend that the problem can be solved with technology, and that we would not then need to change our lives all that much. In a decarbonized society, the wizards tell us, our economy could continue to operate with clean energy. But it can’t. Any ideas to the contrary are simply excuses for perpetuating a world of incredible energy inequality. We need to heed the prophets and use dramatically less energy. We need to accept extreme changes to our economy, our standard of living, and our culture. Andrew Watson is an assistant professor of environmental history at the University of Saskatchewan. USGCRP, 2018: Impacts, Risks, and Adaptation in the United States: Fourth National Climate Assessment, Volume II[Reidmiller, D.R., C.W. Avery, D.R. Easterling, K.E. Kunkel, K.L.M. Lewis, T.K. Maycock, and B.C. Stewart (eds.)]. U.S. Global Change Research Program, Washington, DC, USA. doi: 10.7930/NCA4.2018. Charles C. Mann, The Wizard and the Prophet: Two Remarkable Scientists and Their Conflicting Visions of the Future of Our Planet (Picador, 2018), 5-6. USGCRP, Fourth National Climate Assessment, Volume II, Chapter 1: Overview. IPCC, Global warming of 1.5°C, Chapter 1. IPCC, Global warming of 1.5°C; Detlef P. van Vuuren, et al., “Alternative pathways to the 1..5°C target reduce the need for negative emission technologies,” Nature Climate Change, Vol.8 (May 2018): 391-397; Joeri Rogelj, et al., “Scenarios towards limiting global mean temperature increase below 1.5°C,” Nature Climate Change, Vol.8 (April 2018): 325-332. Mariësse A.E. van Sluisveld, et al., “Exploring the implications of lifestyle change in 2°C mitigation scenarios using the IMAGE integrated assessment model,” Technological Forecasting and Social Change, Vol.102 (2016): 309-319.